Want more naval history? Check out National Membership from The National Museum of the Royal Navy and receive entry to three more museums and exclusive benefits. Enjoy our best value ticket and see 11 amazing attractions across Portsmouth Historic Dockyard. Leave nothing undiscovered with our annual ticket. Love rum? Want to dine onboard one of the most famous warships in the world? Our exclusive rum experience welcomes you on 31 August 2018 from 7pm - 11.00pm onboard HMS Warrior 1860. Enjoy a three course meal, rum tastings, half a bottle of wine and music after your meal. Join us on 1 September and 21 September 2018, 7pm - 10.30pm for our Rum and Gin Festival 2018 onboard HMS Warrior 1860. Enjoy rum and gin tastings, talks and demonstrations on how to drink and store your beverage - you'll even learn how to create your own blend. Relax at our gin and rum bar as you take in the Victorian splendour of your surroundings. From 30th November to 2nd December 2018, 10am - 6pm. The Festival of Christmas is back bigger and better than before – with the return of all the family favourites. Fagin’s Tavern is back in the Spiegeltent, our traditional Father Christmas dressed in green with his reindeer and street performers galore. Portsmouth Historic Dockyard provides experiences that can't be created in a classroom and brings history to life. All visits are designed to maximise pupils' learning experiences and depending on your curriculum, time and budget you have available there are a range of options to suit your needs. Portsmouth Historic Dockyard offers a unique range of historic and modern venues for group visitors seeking to make their visit even more special. Pre-booked groups of a minimum of 15 people are eligible for advanced group rates. Groups who have not pre-booked will be charged a basic group rate on the day. *Prices shown include discount. Offer cannot be combined with other offers or applied for retrospectively. Offers are redeemable online only and applies to 11 Attraction Tickets only. The waterbus is operated on a first come first served basis and is subject to availability. Please see the full booking terms and conditions. Portsmouth Historic Dockyard reserve the right to withdraw this offer at any time. Registered disabled visitors to the dockyard should purchase an appropriate ticket according to their age. They are eligible to bring along a carer for free if required. A complimentary day ticket can be allocated to the carer on request at the Visitors Centre, and is included with the online ticket purchase. For more information on our accessibility, please read our accessibility page. The 11 Attraction Ticket includes entry to HMS Warrior, HMS Victory, Boathouse 4, Harbour Tours, Action Stations, Jutland Exhibition, HMS M.33, National Museum of the Royal Navy Portsmouth, Dockyard Apprentice Scheme, Explosion Museum and Royal Navy Submarine Museum. Are day attraction tickets valid for a year? Single attraction tickets are only valid for one day only. 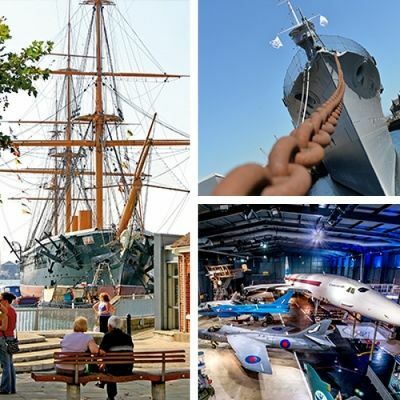 If you would like to visit Portsmouth Historic Dockyard more than once, buy an 11 Attraction Ticket which gives you unlimited access to our attractions. What if I only want to visit for the day? The 11 Attraction Ticket or National Membership from The National Museum of the Royal Navy are the best value tickets. However, we recognise that some visitors can only come for the day – so we have three options to choose from 3 attractions, 2 attractions or 1 attraction which are valid for one day. Can I use any of the tickets for special events? For separate ticketed events, the 11 Attraction Ticket and National Membership will not be valid. Please check terms and conditions of the event at the time of purchase for confirmation. What are the benefits of buying National Membership over an 11 attraction ticket? When you upgrade to National Membership, you get access to three other museums across the UK including HMS Caroline in Belfast, Fleet Air Arm Museum in Somerset and The National Museum of the Royal Navy in Hartlepool. An 11 Attraction Ticket gives you access to attractions at Portsmouth Historic Dockyard only for a whole year. What attractions are included as part of an 11 attraction ticket? Enjoy a year worth of adventures with an 11 attraction ticket.